Sec. Hillary Clinton maintains a slight lead over Sen. Bernie Sanders among women voters in national polls, but, among younger women, Sanders is the clear favorite. A USA Today/Rock the Vote poll from January found that young women prefer Sanders to Clinton 50 percent to 31 percent. 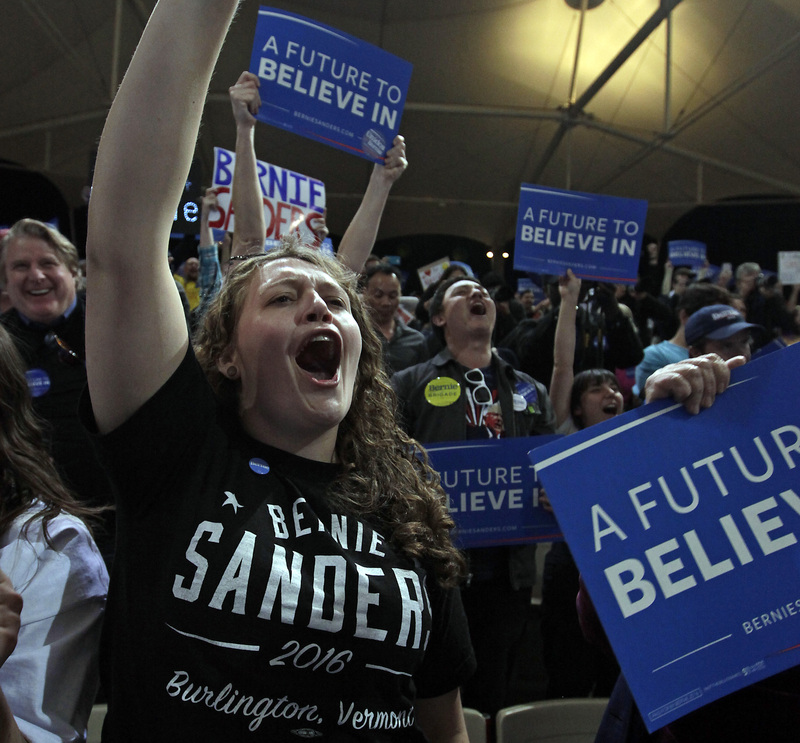 In New Hampshire's primary, a whopping 82 percent of women under 30 voted for Sanders. It's clear that young women are Berning up, but why does this old, white, male senator from nowheresville (Vermont) appeal so much to this demographic — a man who's running against a woman with a noteworthy women's rights record? When you are able to assess the candidates on issues, character and authenticity, Bernie wins our hearts and minds hands down. Of course, we would not be where we are today without fierce and strong female trailblazers who have been paving the way for decades but women in politics is not one-size-fits-all and we are willing to wait for Ms. Right, not Ms. Right Now. Sanders appeals to young voters, including young women, for a variety of reasons. As Hillicker noted, the economy is one of them; a December survey found that a full 72 percent of millennial women said bills and expenses are their greatest source of stress. Both Sanders and Clinton have proposed policies that would benefit young people and particularly women financially: college debt reduction, equal pay, and family leave among them. Likewise, both have strong records of supporting women's reproductive rights and the Violence Against Women Act. So why is Sanders such a stark favorite? At least part of the answer lies in the fact that millennials have a strong anti-establishment bent. About half of millennials identify as Independent, more than any other generation, which indicates a distrust of major parties. Sanders, of course, is an Independent; he adopted the Democrat designation only for his presidential bid. Bloomberg View reported that young voters are also more wary than older voters of military action in the Middle East. This doesn't play well in Clinton's favor, as her role of Secretary of State involved support for several interventions that destabilized the Middle East, and she, unlike Sanders, voted for the Iraq war. Overall, Sanders' talk of a "political revolution" makes Clinton's talk of building on Obama's policies weak-tea in comparison for today's young, sick-of-politics-as-usual voters. Another all-important factor to note when discussing the political preferences of young women in particular is that today's feminism is not just about the struggles and the rights of women. Feminism has expanded to include efforts against various forms of oppression rooted in poverty, race, sexual orientation, and sexual identity. That fighting poverty has been the cornerstone of Sanders' decades-long political career plays well in this regard. He was also an advocate for marriage equality before it was cool; though it's true that Clinton is now a supporter, she only recently "evolved" on the issue of marriage equality. Sanders was the first presidential candidate in this race to respond to the Black Lives Matter movement with a comprehensive racial justice platform. And he's a co-sponsor of the Equality Act in the Senate, which would federally protect LGBT individuals from employment, housing, and credit discrimination. Clinton certainly has some progressive credentials that deserve praise. Along with being a staunch advocate for women's rights in the U.S. throughout her career, she's also paying attention to the needs of minority communities and of the LGBT community. But the length of time Sanders has spent fighting for the economic, social, and political rights of all people posits him as the more authentic anti-oppression candidate. This, plus his general anti-establishment bent, give him a clear advantage among young voters generally and young women in particular.